Customers have to determine the difference between the two listings. Which one is better? Is one a second edition, revised, hardcopy, paperback, kindle — what’s the difference? In addition, since the duplicate listing is almost always available at a higher price, a customer shopping quickly may not notice or locate the original, correct listing and will end up overpaying for your book. We need to take care of our customers and prevent people from overcharging for our books. Before we discuss how to remove additional listings of your book (the exact book — not a revision or alternate media version like an ebook), let’s review why this happens. There are other sellers listing items on Amazon.com. They are often referred to as Market Place (MP) sellers. These sellers list items as either Fulfilled by Merchant (MF) or Fulfilled by Amazon (FBA). MF listings are actually packaged by the seller and sent to the customer. FBA sellers send their inventory to an Amazon warehouse where Amazon packages the items when sold. Upload the book using the ISBN (listed on the back of the book) as the ASIN (Amazon Standard Item Number) used by Amazon to identify products. Some sellers, either out of ignorance, laziness, or in an attempt to beat the system and sell at a higher price, upload their book item without stating the ISBN in the ASIN field. In this case, Amazon thinks the upload is an item not yet in catalog and assigns a NEW ASIN number to the book. Now we have TWO listings. And guess what? 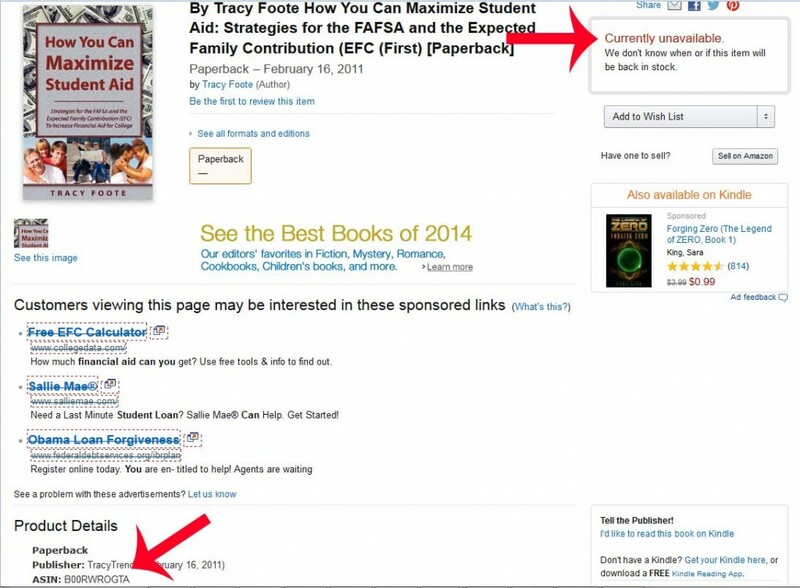 Maybe another seller will come to this erroneous listing and use it to list their copy of your book. Can you see the snow ball impact of this? Multiple listings can also create confusion for those who actually want to sell honestly. To get rid of the duplicate listings, you will need to login to your Author Central Account and send a message to Amazon asking them to delete the listing. “I understand you’d like us to delete the duplicate listings of your books. Sometimes, when a book is listed by Marketplace sellers, it receives its own Detail page instead of being correctly listed under the original Amazon sales page. As you requested, I’ve combined the duplicate listings with ASIN (ASIN of the good listing will be stated here) you noted into the Detail pages for your books with ISBN-10: (your ISBN will be stated here). Here’s why you need to check often for duplicate listings of your title. Suppose a customer finds a duplicate listing before you do, and makes the purchase. Now this “erroneous listing” is out-of-stock! Now not only do you have a duplicate listing, but you have a duplicate listing that states your title is UNAVAILABLE as shown in the image below. The image implies the book is unavailable, and we can see that this is a duplicate listing because instead of a NUMBER for the ASIN, there is a ten digit coding beginning with B (in the lower left of the image). Customers who visited the page in the image, might not have realized they are on a duplicate page, and could have thought the title was unavailable or out-of-print. Then, they would then probably look for a different book. Not good for me — don’t let this happen to you.